“Xavier Bizot once said in an interview that the finest wine he had ever tasted was an Australian wine, a bottle of Penfolds 1962 Bin 60A. This interested me as many of my favourite Australian wines are cabernet shiraz blends. Xavier is part of the extended Bollinger family and I’m sure over the years he has tried some very impressive wines from all over the world. Xavier was a lawyer in Paris specialising in mergers and acquisitions until he met and married Lucy Croser in 2003. He came out to Australia, liked it and stayed. After studying viticulture and oenology at Adelaide Uni, he and Lucy went into their own wine business. Together they have vineyards in the Adelaide Hills and Wrattonbully, run their own brand Terre à Terre and the fine wine importer Terroir Selections as well as manage Tapanappa wines with Brian and Ann Croser. They also make one of the few Sauvignon Blancs I enjoy. I was born in, and grew up in, the village of Aÿ in Champagne. My father was managing Bollinger. We lived next door to the celliers (barrel cellars) and to the Bollinger cooperage – where the Bollinger barrels are still maintained, so from a very early age it was winemaking. I lived there for 17 years. It is a unique winemaking region, so different to the other regions in the world, very well organised, very structured – all with the goal to make high-quality wine and involve everyone in the process – from the growers to the distributors. I have four older brothers, and my father always told us, “you have to find your own way – go and see how the world works and then you make your own decisions”. So I went to study commerce and law in Paris. I graduated, became a lawyer and was admitted to the Paris bar in the late 90s. I spent more than 5 years practicing law specialising in mergers and acquisitions, and evaluating how short-sighted the world of investment banking can be. Family wine business and your connection to Bollinger ? Wine is a long-term thing. Wine families look beyond the short-term and have the ability to focus on quality as a long-term goal. The Champagne house Bollinger was founded on February 6, 1829 in Aÿ. 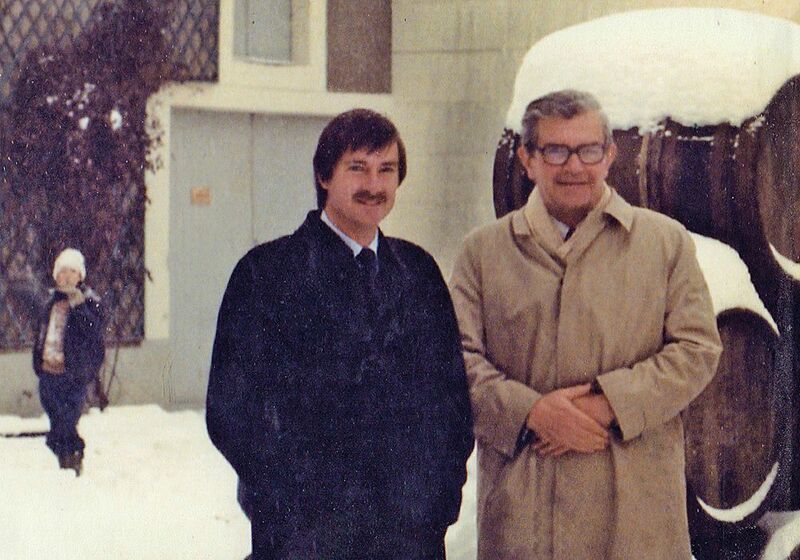 My late father, Christian Bizot, nephew of Lily Bollinger, started at Bollinger in 1952, and managed it from 1978 until 1994. The Bollinger family is at the helm of a group which now owns Chanson in Burgundy and Langlois Chateau in the Loire Valley (both brands we distribute in Australia), the house of Ayala in Champagne and small Cognac producer Delamain. My older brother Etienne now successfully manages the group for the family. “well the first 300 years were a bit hard but now it’s going okay”. Lucy and I own Terroir Selections and Terre à Terre, we also manage Tapanappa with her parents, Brian and Ann Croser, all wine ventures created this side of the millennium, only 15 years in. You married Lucy in France in 2003, what prompted the move to Australia. Lucy and I got married in Aÿ early December 2003. It was very cold, and then we had an Australian celebration on the 31st of December 2003 in the Tiers vineyard Piccadilly and it was very warm. We always planned to start something of our own, independently, in the wine trade, we weren’t sure what at that stage. We had our first child Christian in Paris. We were both still working there. We came to Australia for holidays in January 2005 and it was still warm. We were here for one month, traveled around, had a look and decided this is where we wanted to be, life was much easier. I had to go to Berlin to get my spouse visa, so Lucy and I flew to Berlin with Christian – it was minus 10° in March 2005. I got my spouse visa and resigned from my law firm. We started our own business Terroir Selections importing fine wine with one Alsatian brand, Domaine Marcel Deiss, which we still import here. I studied viticulture at Waite Campus (Adelaide Uni) with Dr Peter Dry in one of his last years in 2006. He is one of the best teachers I ever had, then I did a year of oenology in 2007 at Adelaide Uni. In 2008 Lucy and I started Terre à Terre with one wine – a Sauvignon Blanc – from our close-spaced Crayères vineyard in Wratttonbully. Vineyards : You planted the Crayères Vineyard at Wrattonbully in 2004. Why there ? I’ve known Australian wines ever since 1984 when Bollinger got involved with Petaluma and Brian, so I’ve been familiar with Australian wines ever since then, and for me the best ones have always been Coonawarra reds. The 1979 Petaluma Coonawarra was an early encounter of the Cabernet Shiraz blend and my father always told Brian he shouldn’t have gone with Cabernet Merlot for the Petaluma Coonawarra, it is all history now… Coonawarra is a small wine region making, at its best, very elegant and superb wines. One of the first books I have read on Australian Wines was Coonawarra by James Halliday (published in 1983), and it is probably one of the best books on Australian wines. The first pages have a map of all the vineyards in Coonawarra, that’s always a good start. The book is all about stories of the people who ventured to make some extraordinary wines in a remote area, it is a book about terroir – before the word meant anything in English. Brian gets a mention too as setting new standards for the region with his 1979 Petaluma Coonawarra. Hugh Johnson says in his History of Wine that Australia is the France of the Southern hemsiphere and James’ book on Coonawarra proves the theory right for me. Brian had bought the Koppamurra vineyard from John Greenshields in 2004 (now renamed Whalebone Vineyard) and Lucy and I bought some land across the road. Wrattonbully is 25 to 30 km north of Coonawarra, it used to be included in Coonawarra but in 1999 the Coonawarra growers decided to close the gates, so Wrattonbully had to find its own name. Wrattonbully climate is slightly different to Coonawarra, its soils are marginally older and limestone much older (35 million years-old vs 800,000 for Coonawarra), it’s also higher at 80 m above sea level. I know that the winemakers at Penfolds now value Wrattonbully fruit very highly, especially Cabernet Sauvignon. In 2004, we first planted Sauvignon Blanc on the white sandy soils (eastern aspect of the limestone ridge) and Cabernet Sauvignon on the red clay soils (western aspect of the limestone ridge). In France we have a saying, white soils for white wines and red soils for red wines. In 2008 we added one hectare of Cabernet Franc and one hectare on Shiraz in between, on the top of the limestone ridge. When we planted the Crayères Vineyard (named so because of an ancient and extraordinarily-well preserved limestone cave that lies under the vineyards) – there was a lot of talk amongst wine professionals about French Cabernet clones – and there still is. Brian advised us to plant all Australian clones on root stock, close spacing (1.5m x 1.5m) – and we will do the same here in Piccadilly when we plant our next Pinot Noir vineyard. I think we are sometimes too quick to assume that a clone selected in French vineyards will be adequate for Australian climates and soils. France has a completely different climate – and much richer soils – than Australia. In France we have four marked seasons – in Australia we have two seasons to be honest, the differences are not that marked. And in Australia we’ve got those very long El-Nino / La Nina cycles of five-seven years of drought and then one-three years of wet weather which have a significant impact on agriculture. Vines are very adaptable so over the years the vines adapt to their environment, to where they are. A research project is underway at the University of Adelaide, looking into vine epigenetics and how the vines adapt to their environment by changing the way they express their DNA. Common sense tells us that it is better to plant a cutting from a vine that’s been producing great wines in Australia for 150 years rather than transplant cuttings from a vine that has been experiencing a totally different climate for the last 300 years. That said, we have planted a French clone of Sauvignon Blanc (from the Cher) in Wrattonbully, and it will be great to see how it evolves. The Crayères Vineyard is a French designed – all Australian vineyard which is looking great. It has close spacing 1.5 x 1.5m, vertical shoot positioning and all vines are planted on rootstocks. We are currently designing specific equipment to keep the vineyard herbicide free (a challenge for narrow rows and rocky soils…). We are almost organic, but I’m not sure we want to be certified, because to retain that we might be forced to do things we don’t want to do. I believe in intelligent, practical, minimal intervention in the vineyard, rather than bureaucratic marketing. Vineyards or Winemaking, any thoughts on what’s more important ? Good wine is made in the winery, great wine is made in the vineyard… that’s what they say. To make great wine it starts in the vineyard not in the winery. Work in the winery is very important to ensure the finished wine is best expressing the fruit characters from the vineyard. Then there are the blending decisions and this is the part where things get personal and where a vigneron leaves its mark. What style wines are you striving for ? I don’t strive for any styles, so I don’t have any definite style in mind, I just like to discover what our vineyards offer us every new vintage and how we can make the most of it. We are just trying to make consistent wines and improve them every year. It’s all about balance between fruit, acidity, tannins, oak. We want to make wine that will age for a very long time, with more tannins, more fruit, more texture, more everything. We are here for the very long term, we don’t look too much at the trends and fashions. We just want to improve our viticulture every vintage. I want a very balanced canopy, not too much vigour, well-spaced fruit on the cordon with optimal bunch exposure. In terms of winemaking we are trying lots of different things, different oak, new oak, old oak and then improving our blending skills every vintage to make the best wine. I’m from Champagne, assemblage is what we do best! Terre à Terre Sauvignon Blanc : Huon Hooke once wrote “It is a delicious wine: serve it blind to someone who is a noted sauvignon blanc-hater and watch them enjoy it ! ”. What’s the story ? I learnt a lot in 2008, the first year I made the wine. We went into the vineyard and tasted the fruit every week, until we did not see any green flavours (which a lot of Sauvignon Blanc winemakers still want in their fruit). When the green flavours had completely faded away we saw that the fruit was starting to develop intense spice flavours. This is what I have been looking for every vintage to decide picking dates. This waiting game takes a bit of guts as things can go wild with Sauvignon Blanc (as in 2011 – we had no sound fruit to pick !). In the winery we make different batches of Sauvignon Blanc, whole bunch and crushed, tank and oak, large oak foudres and demi muids. We are probably more innovative with our Sauvignon Blanc than a lot Riesling or Chardonnay winemakers, we take it very seriously and try to find the best approach to best express the exceptional quality of the fruit, and that will allow the wine to age. I really think I’ve discovered Sauvignon Blanc has the potential to make world class – fine white wines, with the right terroir. Your Summertown Pinot from Piccadilly Valley ? We are building our house on the higher slopes of the Piccadilly Valley (Adelaide Hills), just under the Bizot vineyard where we grow the Chardonnay for our Daosa Blanc de Blancs Méthode Traditionelle. I came across another vineyard in Summertown via our architect, planted to Pinot Noir in 1987. We started managing it in 2016 and called it the Summertown vineyard. There are not many spots for good Pinot Noir table wine grapes in the Piccadilly Valley because it’s too cold at night. The Summertown vineyard is on the top of the hill, and the cold air goes down the valley quickly during the night, so the vines are in a warmer meso-climate. It also faces east so it just gets the morning sun, not the afternoon sun so the fruit is not too cooked and we don’t get too high alcohol. So, to summarise, it is very similar to Stephen George’s Ashton Hills vineyard, full of old Australian Pinot clones goodness. The wines are looking good, it’s still early stages. I think we will make better and better wine as we understand the vineyard better. The thing with Australian Pinot – and Australian wine in general – is that there is too much unnecessary benchmarking with Europe. We benchmark ourselves too much to Burgundy. It tells a lot about Australia and a sort of inferiority complex vis a vis the Northern hemisphere. Our wines are world class. For example, Brian’s Foggy Hill Pinot. When I taste the Tapanappa Foggy Hill, it’s a great wine, but it is not Burgundy. It’s just a great wine to drink, it’s not Burgundian, it’s Australian terroir. And I believe we can make some good Pinot Noir wines in Piccadilly Valley too, from well selected sites. 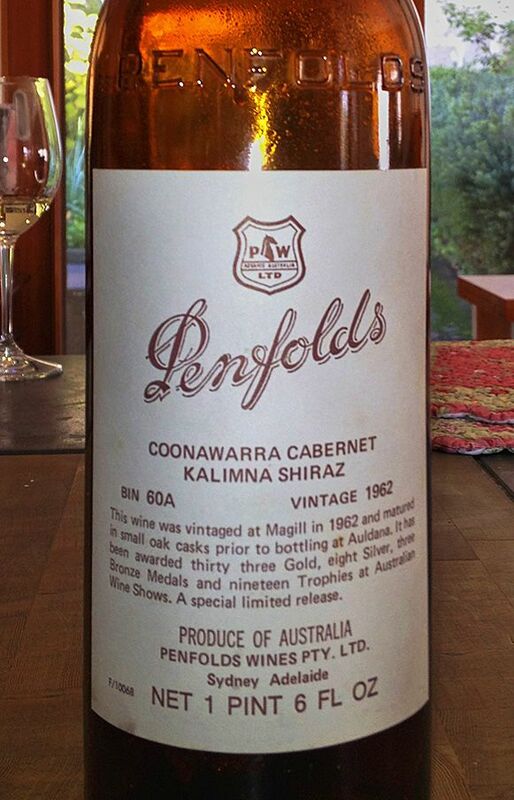 You were once quoted as saying the best wine I ever tasted was a “Penfolds Bin 60A 1962”. The back label ? It was an amazing wine – I’d like to drink it again one day, not sure I could afford it now. I bought it at East End Cellars one night to say thank you to Brian and Ann for looking after us while we renovated our house. It had just been through the re-corking clinic and was looking pretty good. We tasted it with Brian and Andrew Jefford, together with a very good Bordeaux. The Bin 60A was still very much alive after three hours, the Bordeaux was gone, although it was a 1986, not a great vintage. I think Cabernet Shiraz is the biggest draw card for Australian wines, no one else does them and they age so well. What Yalumba has done with its Caley is great and more should hit the shelves. There should be 100 more wines like that from South Australia and they should become the premiers crus of our State. We have Penfolds Grange, but we should be more serious about marketing those top end Cabernet Shiraz blend wines to the world. When we look at export we can get great Pinot and Cabernet Sauvignon from many countries in the world. Only Australia has the Cabernet Shiraz, it has to be looked at as a competitive advantage. The good ones are not bold and beautiful Barossa like, they are very fine and elegant. The Caley is a good example, a world class wine, I hear it’s almost sold out so maybe Rob could have priced it higher to match Grange and Hill of Grace prices. From our Crayères Vineyard, we have made a Cabernet Shiraz for the first time in 2015, which hasn’t been released yet. We had it blind with a French relative who works in the wine industry in France. He thought it was “too good to be Australian” – he is French – I was pretty happy. There was also a very important winemaker at the table as well and he said he liked it a lot, but he had a cold so maybe this does not count as a full endorsement. It will be our top wine from Crayères Vineyard, the blend will change every year in percentage but we will try and make it better every vintage as we perfect our blending skills. As I’ve said probably 20 times during our conversation, it all takes time, it’s all about the learning experience in each vineyard, vintage after vintage. I don’t see enough wine people in Australia simply talk about their own vineyards. There is a lot of gimmicky talk about clones, how to use stalks, what barrel copper to work with, natural or organic or biodynamic religions, that’s all very interesting marketing and it works well. But what’s important longer term is where the vineyard is planted, how it is planted and then how it is managed in the long term by the vigneron. This is terroir, not a scientific concept, more a long term partnership. Huon Hooke: "Xavier Bizot is bringing Cabernet back"
Jancis Robinson: "A complex and really interesting wine"